Easy way to make amazing chokers (necklaces) and crowns (headband) with hot glue gun. I show how to make a Queen Spider (Black Widow) Crown and choker, Gold Queen of Nature Crown and necklace, Nails In The Head Crown and Creepy Choker. I start with a spider kit – #DIY Spider Web Crown And Choker out of hot glue. You will need a hot glue gun (obviously), baking paper, black acrylic paint, a headband and rhinestones for decoration. Super easy and looks just stunning. The second kit is what I would wear for Halloween – Queen Nature (crown and necklace). You will need dry branches (I recommend to use a fallen branches from linden), headband, hot glue, gold acrylic paint, gold ribbon. Must confess – I’m in love with this costume. And the last one is a creepy one but funny, as I think. Kind of clumsy girl who took a hammer and nails and that’s what happened. 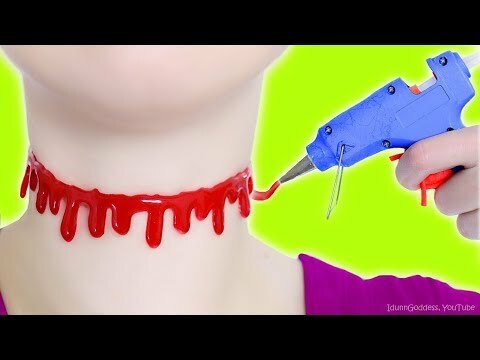 You will need a hot glue, headband, nails and bolts, red nail polish; for the #choker – just hot glue, red nail polish and 2 ribbons (to fasten the necklace). Have fun! Love you! Idunn.